Everyone outside of Wilkes, Oglethorpe, etc. You've checked Ancestry.com; you've looked at the free resources at the US Genweb; you've even searched the subscription websites available through the FamilySearch Center Portal. What's your next step? It can be difficult to find genealogical information on the Internet if you don't know where to look. While using a search engine like Google is a good first start, you may also want to consider website indexes and lists and genealogical specific search engines as you continue to search for your ancestors. So last week my beautiful and wonderful Mother in law Winda (Viverette) Webb and said she had spoken to Great Uncle Tyree, her father's younger brother. On this last call she wished him a Happy Birthday but also found some new information. 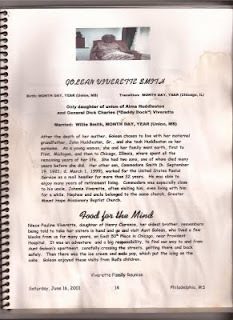 So according to the Viverette Reunion Booklet and some census records that Golean Viverette was not Alma Huddleston Viverette or Doc Viverette's daughter. Apparently, Golean was the daughter of Cardelle McCurdy Boler or Brown Williams. Now, Golean went on to marry and move to Illinois but whomever filled out her death certificate left a lot of information out. More to come soon.